In my article Building Generational Wealth I discussed how I plan to contribute $16,000 to my grandchildren at birth in order to give them a huge jump start on wealth building. 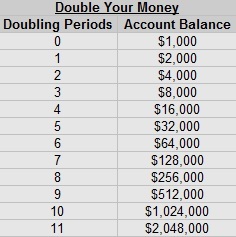 Using the rule of 72 and an assumed 8% annualized return, $16,000 will become $74,000 at 20, $161,000 at 30, $347,000 at 40, 750,000 at 50, $1,100,000 at 55, and $1,600,000 at age 60. But that’s just theoretical right? There are a lot of assumptions built into this and we have no real way of knowing if these returns will materialize. I decided to check these estimates through analyzing historical situations. I wanted to see what would happen if my grandparents, my parents, myself, my sister, and my children had received equivalent gifts at birth. To figure this out I first used calculator.net’s CPI calculator to find the inflation adjusted equivalent in all of these years for $16,000. My grandfather was born in 1926, which was probably the worst time in American history to purchase stock. Since the data in the calculator I used only went back to 1928 I used a stock purchase for this date, just 1 year before the market crash that started the great depression. 10 years in, the value of the account was less than the invested amount, however by 55 he would have an inflation adjusted $704,000, which could fully fund a modest retirement. On my mom’s side of the family her parents were born during WWII and would have had the most benefit from such an inheritance. By age 50 the roughly $1,000 investment would have grown to over $2.3 Million in 2017 dollars, enough for a very nice and extremely early retirement. My parents born 1 year apart in the 60s would have accounts worth just over $1 million at age 50 in 2017 dollars. Time will tell how well the accounts would grow past then, but still this is well above my projections of 8% gains. My sister and I were born 4 years apart, but so far that has made a wide difference in the results. 30 years in her value was $236,000 while mine was $131,000, Once again, even accounting for the dotcom bust and the great recession, my account would still be above the projections at 8% returns. I also checked where my oldest son would be had he received the same gift. His account at 10 years old would have been over $36,000! In virtually every time period in modern U.S. History the concept of the early inheritance works wonders. These historical data points certainly give validation to the concept of gifting an inheritance at birth. 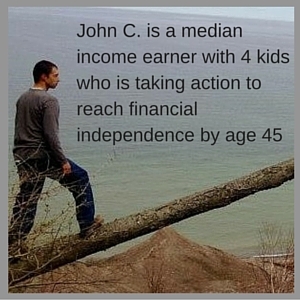 The most difficult financial hurdle in life is saving for retirement. It takes decades of consistent savings for most people to reach the ability to quit work and to live off of accumulated assets. We are always told to start saving young, but that is extremely difficult to do. Most people have no significant earnings until they are 20, and even then, buying cars, buying a house, and starting a family drain available resources from retirement planning. Years ago in a conversation with my dad he mentioned that financial planners often say that $1,000 saved in your 20s is the same as $5,000 saved in your 50s; but what they don’t tell you is typically it is MUCH easier to save $5,000 in your 50s than it is to save $1,000 in your 20s. At the same time, inheritances are often given when a loved one dies, and they typically give their money to their children. Here’s the problem, most people are already established adults and don’t need the money by the time their parents pass. Let’s put it this way: Would you rather receive $500,000 at age 65 when your parents pass, or would you rather each of your children receive $16,000 at birth from their grandparents? I would argue that the much smaller gift at birth for your children would have a far greater utility. 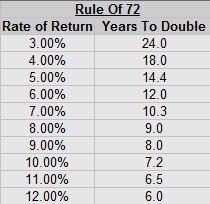 Since your kids wouldn’t be using the money for many decades they have many doubling periods of time available, especially if historic returns of between 8% and 12% continue. Since you should never rely on an inheritance because of a myriad of possibilities, by age 65 you have a fully funded retirement, your children are long since grown and out of the house, and your house is paid off. That $500,000 will most likely not change your lifestyle much. Now how would $16,000 at birth affect your child’s lifestyle? Well it would allow them to allocate more of their income, time, effort, and thoughts towards immediate needs when they are in their 20s and 30s; buying a house, starting a family, spending time with their kids. It takes away a primary worry for most people; saving for retirement. This is why I am planning on gifting $16,000 to all of my grandchildren at birth. What if you only have $8,000? or $4,000? Any money is better than no money. A $4,000 contribution to each child still greatly increases their long term wealth. A $4,000 investment at birth , with a conservative 8% return would yield over a quarter million dollars at age 60. I chose $16,000 because it is an amount that should grow enough to provide a full retirement and also because it is low enough that it is possible to fund with under 6 months of our current savings rate. $16,000 is at a point of maximum utility for this purpose for me. What do you think about changing the way we give inheritances? Would you prefer to give inheritances while still living or posthumously? 5 Responses to "Gifting an Inheritance at Birth"
That is so wonderful! I’m sure your grandkids are going to appreciate your sacrifices to give them such a great gift. Mr. Picky Pincher and I were discussing this last night, actually. Once we retire early, we’re not sure what to do with the money. Ideally we’d hand the fund over to our kids, but I’m not sure if I want to hand over automatic early retirement to them. Helloooo trust fund baby syndrome. 😉 But I think there’s a happy medium between getting a good leg up and learning the value of hard work. Yeah, I’m somewhat concerned about this leading to an entitlement mentality. When I think of trust fund kids, I think of people who will receive millions in their 20s. I think with the amounts I’m planning they will end up okay, because it’s no where near enough money to skate through life on. They still have to have a career to support themselves for roughly 30 years of adult life, and they will be highly encouraged to save more money on their own to help provide a higher standard of living in retirement, or to achieve other goals. This is an excellent tool for easing the burden on the generations following us. I’ve added this into my financial plan, alongside a similar portfolio and student-debt-free for both our children by their respective thirtieth birthdays. My household is thankfully far enough along that we can consider this in good conscience. Other stuff my wife wants to do and have means I get to go back into the work-force, after a 21-month “stealth run” at early retirement. Many thanks for posting up your thought provoking ideas on how to build integenerational wealth. They make a lot of sense to me and provide a good starting point for how to plan for my descendants. Things are certainly not getting easier for young people, especially in New Zealand where house prices in urban centres are going through the roof. The idea of alleviating some if that stress for my children and grand children appeals greatly. I found your spreadsheet very interesting. It’s a shame my grandparents couldn’t have done that for me! Never mind. I also agree with your notion that giving money at birth is somewhat more helpful than inheriting in your fifties as happened with me. I sadly lost my parent a couple of years ago. I inherited a reasonable amount of money that I’ve started investing for our kids. As you say it makes a little less impact receiving it later. Nevertheless it is greatly appreciated and has given me some more options to pursue my interests that I didn’t have before. Thanks again wonderful blog. It all makes a lot of sense and is timely for me as I am thinking about succession planning having just lost my parent.